When you begin to notice cognitive impairment in your loved one, it can be difficult to fully grasp and understand the changes that your parent is going through. Although we all tend to have problems with memory – as well as other senses – as we get older, there are some signs that a full Alzheimer’s test is needed. This may be a difficult life event for you and your family. However, the earlier Alzheimer’s is detected and diagnosed, the sooner treatment can begin. If patients start their regimen in the beginning stages of cognitive decline, it becomes much more manageable to treat Alzheimer’s, making quality of life better for patients and caregivers. There are several Alzheimer’s tests that a medical professional may recommend for your loved one if you start to detect dementia symptoms. Although there is no specific “Alzheimer’s test,” according to the Mayo Clinic, a doctor who is specialized in the field should be able to identify signs of dementia and also know if those symptoms are due to Alzheimer’s. There are several aspects of your parent’s mental health that can be observed during a physical exam. During these assessments, you can expect a health care professional to ask about diet, nutrition and alcohol use. He or she will also likely listen to your mother’s heart and lungs, collect blood or urine samples for lab testing, and check vitals like blood pressure, temperature and pulse. There are several physical conditions that can link back to Alzheimer’s, including vitamin deficiencies, liver disease, kidney disease, diabetes, depression, anemia, thyroid issues and circulatory system problems. Part of a physical exam is reviewing a complete list of your mother’s medications. Since drugs can have adverse effects on the mind and body, it is important that you bring a detailed list of all products your mother may be using, whether they are prescriptions, over-the-counter medications or supplements. It’s highly likely that a specialist, if you and your mother or father choose to visit one, will look over your parent’s medical history and see how any past, current or chronic conditions and medications might have influenced her mental health. For example, your mother might also be asked about your family’s history of mental and physical ailments, so it might be useful for you to attend the appointment with your mother in case she has trouble remembering some of these facts. 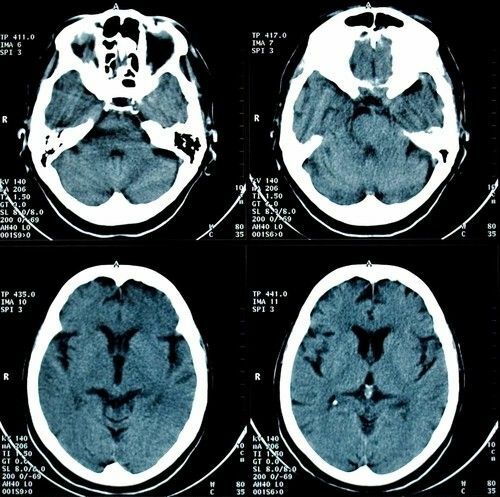 Another standard procedure that a doctor may recommend is brain imaging, whether it be through a computerized tomography (CT) scan or magnetic resonance imaging (MRI). For the most part, doctors will use these tests to rule out other conditions, such as tumors, stroke evidence, severe head trauma damage or the build-up of fluid in the brain. Technology in this field is expanding, according to the Alzheimer’s Association, so in the coming years, brain imaging might become even more helpful in detecting dementia in its earliest stages. The Mayo Clinic also stated that some doctors might recommend positron emission tomography (PET) scans. This test is a bit more intensive than the other two, as your mother will be injected with a low-level radioactive tracer, then a doctor will use an overhead scanner to see how the tracer flows through her brain. Although this might sound a bit intrusive, PET scans can help a medical professional more accurately understand which sections of your mother’s brain aren’t working well and also detect plaque in the brain. In addition to brain imaging, a doctor may perform a neurological exam to further investigate the possibility of stroke, Parkinson’s disease, brain tumors, brain fluid accumulation or other diseases and conditions that influence memory and cognitive function. Some of these tests will specifically pertain to reflexes, eye movement, speech, coordination, muscle tone, strength and sensation. This is one of the best ways to determine if your mother’s mental processes are having an impact on her bodily movements. According to the Mayo Clinic, it’s possible that your mother’s doctor might recommend neuropsychological testing for a more extensive glimpse into her memory and thinking processes based on her age and education level. Often these tests are given in the earliest stages of Alzheimer’s to help better identify patterns and triggers. There’s a chance that you’ve heard about testing for certain genetic markers for Alzheimer’s. However, it’s important to note that although there are some genetic tests available for people with Alzheimer’s, they are not recommended across-the-board for patients, according to the Alzheimer’s Association. Based on their expertise, there are two types of genes that contribute to the progression of the disease: risk genes and deterministic genes. For risk genes like APOE-e4, the strongest of its kind for Alzheimer’s, there are certain blood tests that still remain controversial, are usually only conducted in clinical trial settings and should only be considered after a thorough discussion between you, your mother and her doctor. In rare cases, there are also deterministic genes, such as the types that result in autosomal dominant Alzheimer’s disease – also known as “familial Alzheimer’s.” However, these instances are rare and usually left up to the discretion of the family as to whether not they want to know their genetic status. Although testing and treatment can be painstaking process for both you and your mother, it is important that she gets the treatment she needs to help manage dementia and Alzheimer’s from the beginning. More questions? Visit an Aegis Living community and speak with our care professionals.